Availability:: Sorry, this item is NOT available for USPS Priority Shipping. Please choose another shipping method. Help make people’s lives safer by applying Windshield Defender to their windshields! (See Windshield Defender Consumer Kit for more details.) This is a great add-on if you are a professional doing windshield or detailing work already. 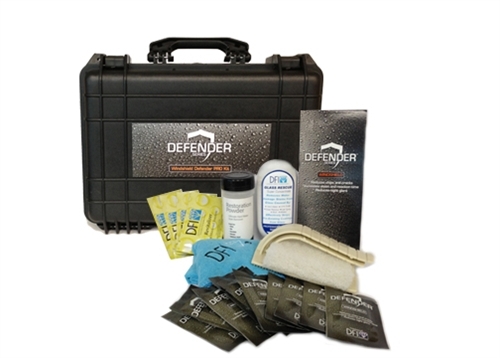 The Windshield Defender™ Pro Kit comes with enough Windshield Defender™, DFI proprietary cleaning products, and tools to ensure high-quality applications on 10 standard size windshields. This kit also includes DFI Revitalizer NanoPax® to help you build repeat business as well as sales cards and other sales and marketing aids, with a rugged case to organize it all. All products are available separately for reorder in professional quantities. Contents: 10 NanoPax® towelettes (packets) Windshield Defender™, one 160g bottle Glass Rescue™, one 60g bottle Restoration Powder, a 3”x6” scrubber with backer handle, two large DFI microfiber towels, 10 NanoPax® DFI Revitalizer, 20 Windshield Defender™ sales cards, one laminated demonstration card, one set demonstration jars, a DFI tips & advice booklet, and a rugged 18.1”L x 14.17”W x 7”H high-density case. Each single Windshield Defender™ NanoPax® towelette will cover up to approximately 14 square feet.